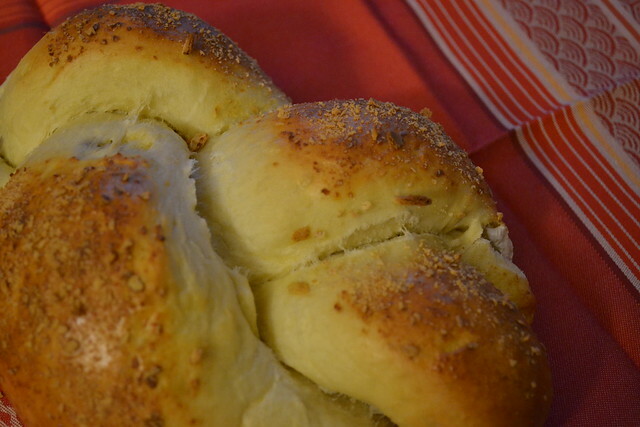 After our adventures in Cinnamon Sugar Challah, we also tried a return to Herbed Challah while we were on vacation. 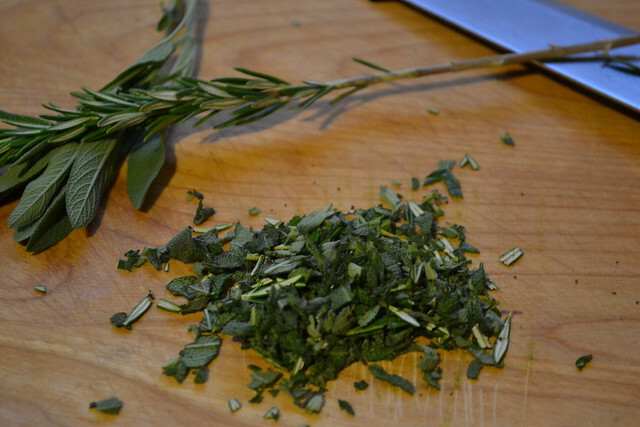 For this challah, I chopped up some fresh sage and rosemary quite finely. 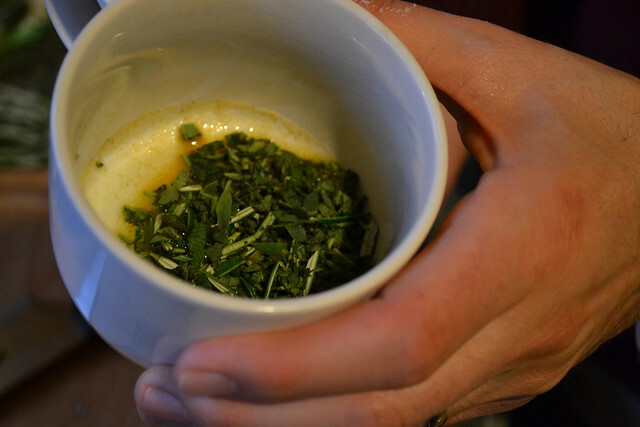 The Hazz then made a mixture of olive oil, garlic powder, and the herbs. 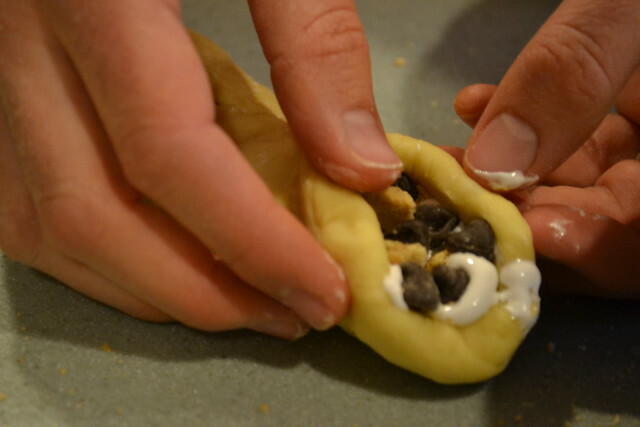 Using a pastry brush, he covered a rolled-out piece of dough with the mixture. The whole process then get, as one would expect, a little oily. 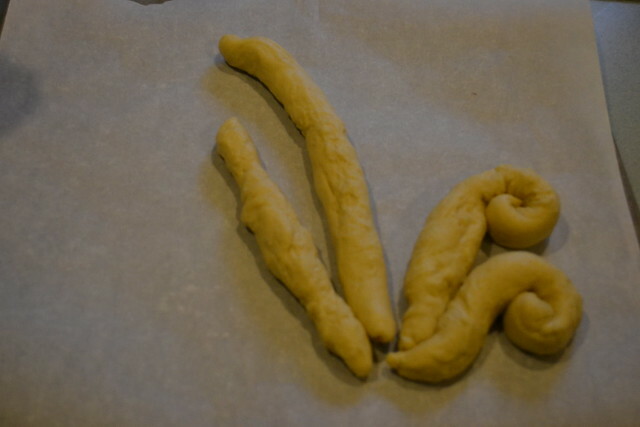 After some slip-sliding and quite a bit of additional flour on the strands, a coil we achieved. 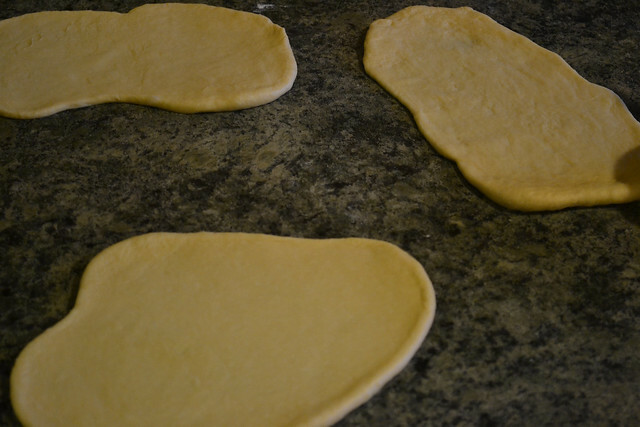 Of course by then we had over-floured the strands and couldn't get the bottom to stay tucked in. 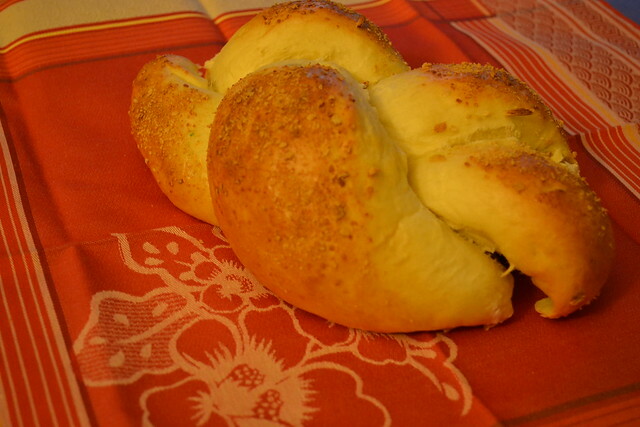 This challah was delicious and quite surprisingly flaky. 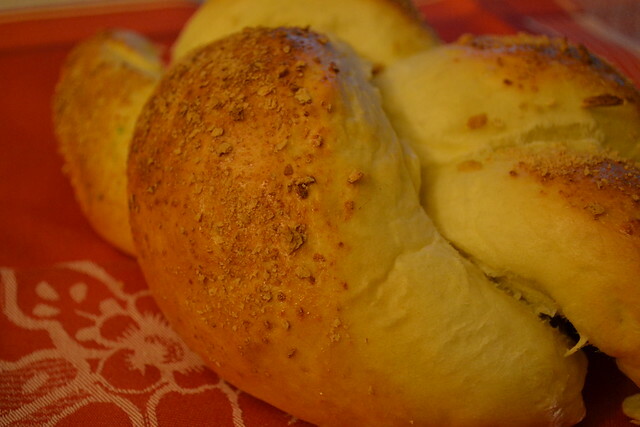 I'm so glad we tried making herbed bread again. 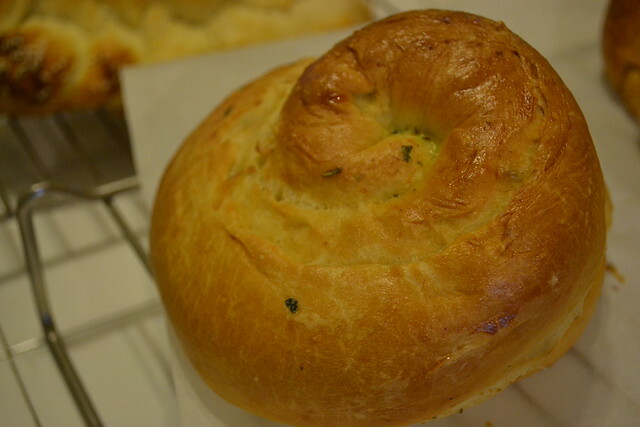 I think savory challot may be the way to go for us for a while. There are a lot of options to match with a meal. What recipes are you returning to this week? Shavua Tov from Rhode Island (which is famous for you, if you haven't heard)! The Hazz and I are visiting his parents this week. That involves relaxing, eating, playing with the dog, and general family-being-togetherness. It's great. 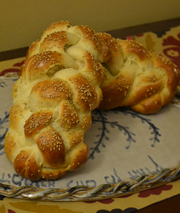 We took our charge to make Shabbat dinner this past Friday as an inspiration to return to an old favorite, Cinnamon Sugar Challah, and give it a bit of tweaking. Inspired by my mom's alteration of challah into Challah Cinnamon Rolls, I opted with cinnamon sugar to use a melted margarine (you could also use butter if you're not fleisch) on each rolled out strand. This sets a nice stage and a wonderful softness for each strand. 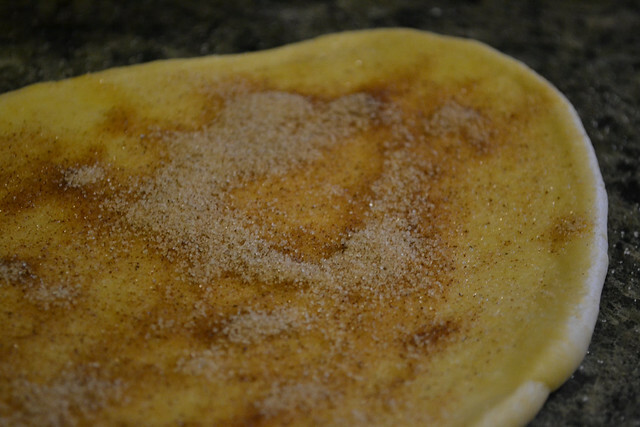 Looking back, we would have used even more on the cinnamon sugar mixture. Really lay it on thick. 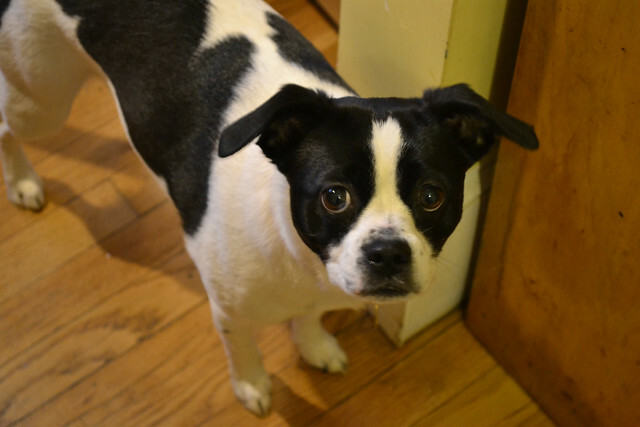 While we were taking photographs, our little friend Emma became very concerned about the whole ordeal. Get prepared for some serious cuteness. Bake as normal. 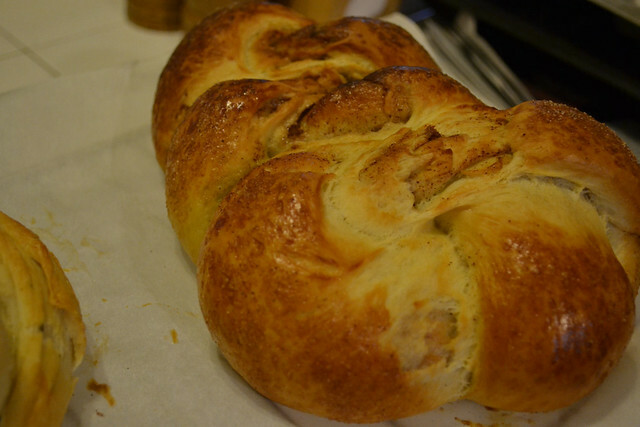 We saved this challah for Saturday morning, and it was a wonderful Shabbat breakfast! I've talked before about how much The Hazz and I hate corn syrup and artificial dyes. 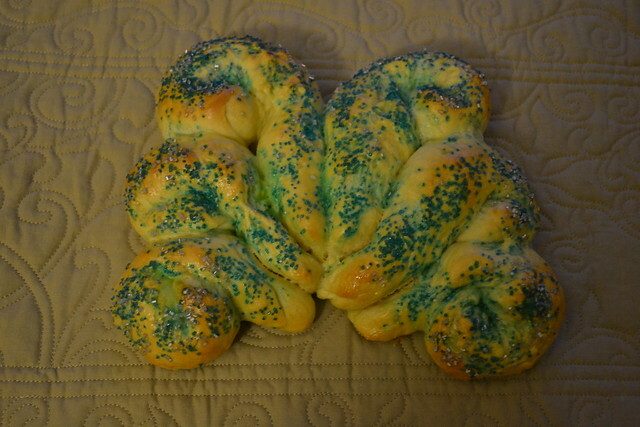 However, I also recently ate my words with the recent blue-dyed Parting of the Sea Challah. So we figured it wouldn't hurt us that much if we had a little marshmallow fluff in our lives. That's right, marshmallow fluff. 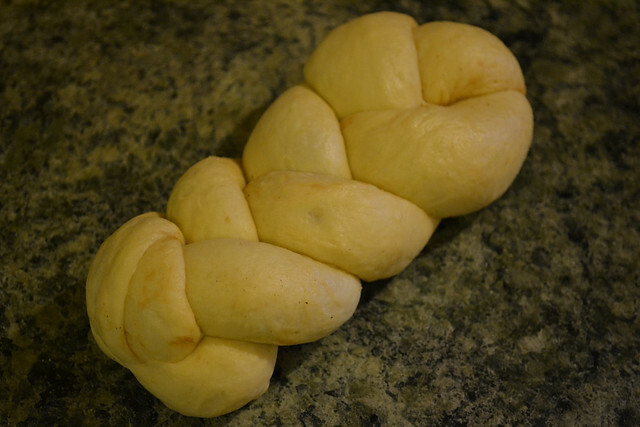 After we made this challah, I told my friends about how we had made it. That launched into fond childhood memories of fluffernutters, marshmallow fluff on graham crackers, cookies... and spoons. Okay, I seriously just stopped writing this post to have a spoonful. It's that good. Alright, back to the post. 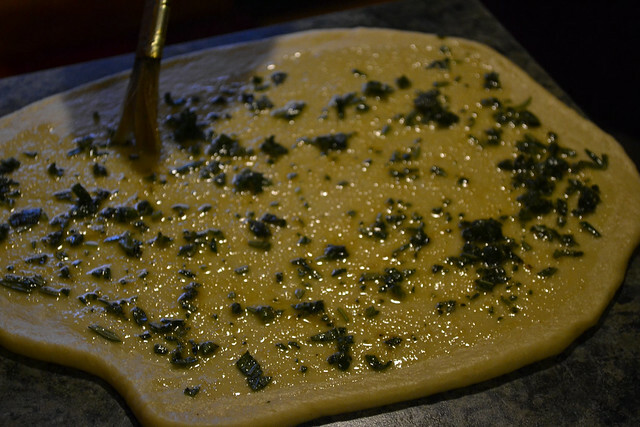 First, we divided our dough into three. 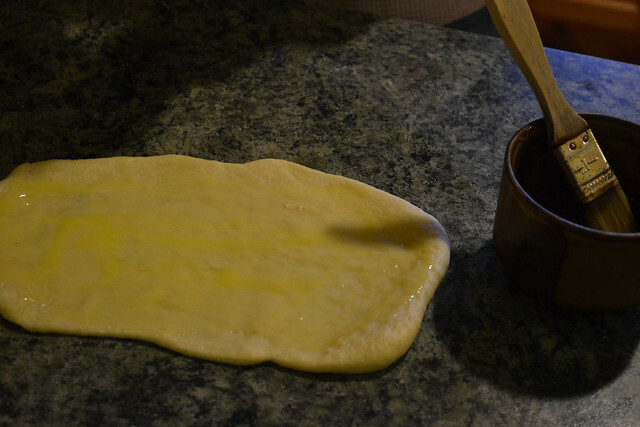 We used a method modified from our Nutella Challah. 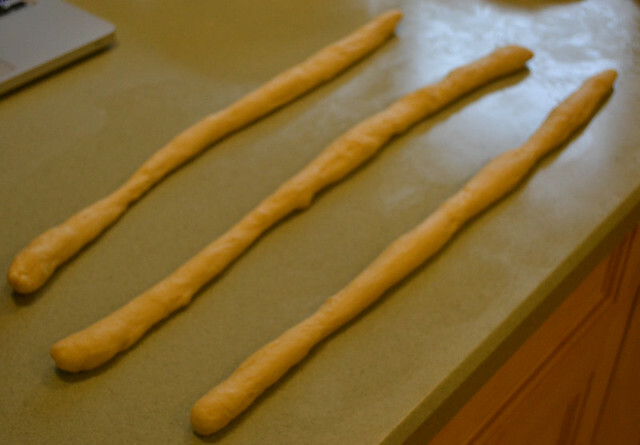 I first created short logs and then rolled them out flat with a rolling pin. 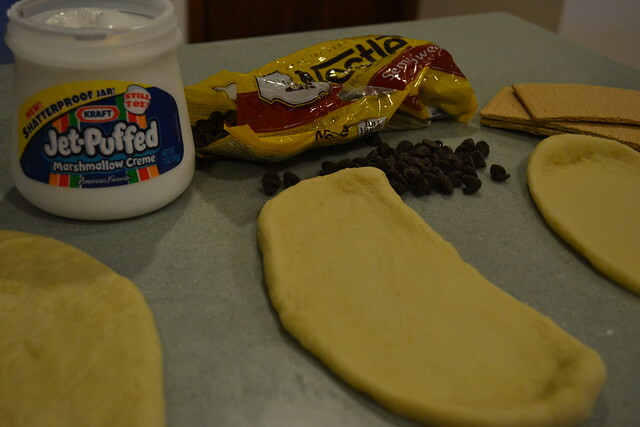 Then, we took our marshmallow fluff, and our chocolate chips, and our graham crackers. 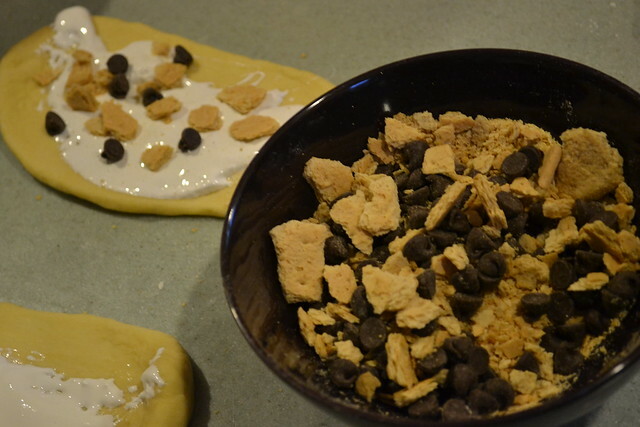 We crumbled up the grahams and mixed them together with the chocolate chips. Then It's important to do this step before you do the fluff because the fluff sort of relaxes once it's out of the jar and becomes slightly liquify. Next spread the marshmallow fluff liberally on the dough with the back of the spoon or a knife. The picture below shows a little bit of graham and chocolate. Seriously not enough. We put like three times that amount on. Once you've topped all of your strands, bring them together like a canoli. Braid carefully. We only did like three or four overs. 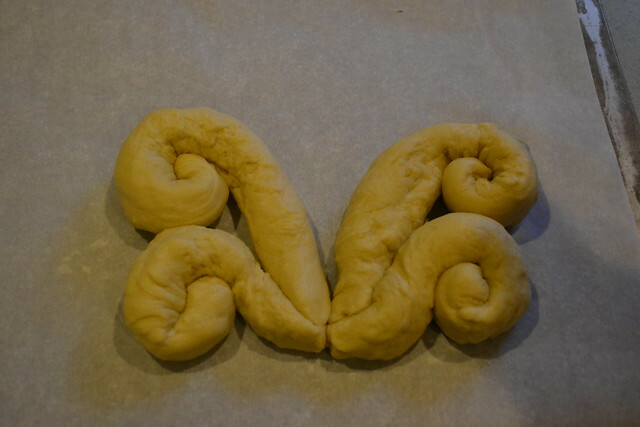 When you're braiding, try to fold the seams down so their inside the loaf. Let rest for about 20 minutes. 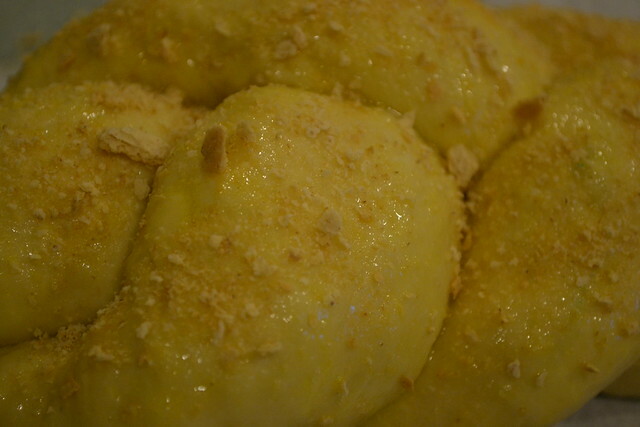 Egg wash and sprinkle with finely crumbled graham crackers. 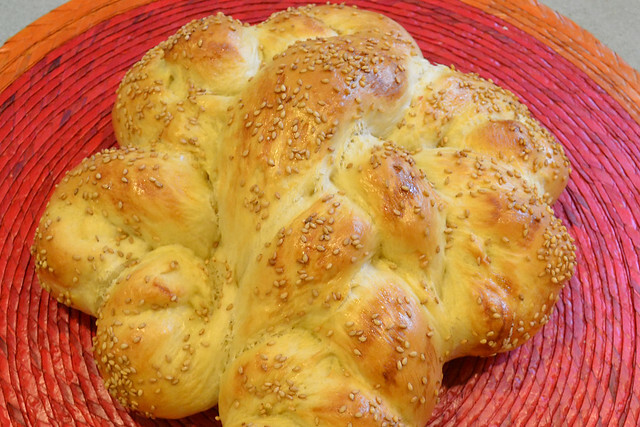 I highly recommend baking this challah on parchment paper. We were lucky and had very little breaking open of the seams, but it will help with clean up. Bake at 350 for about a half hour. 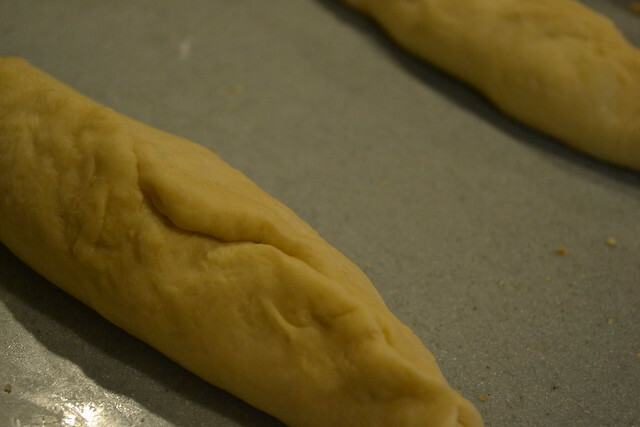 Press the seams to make sure they seem baked through. The result. WOW! I tried it when it was warmish, and it was pretty much like a campfire. 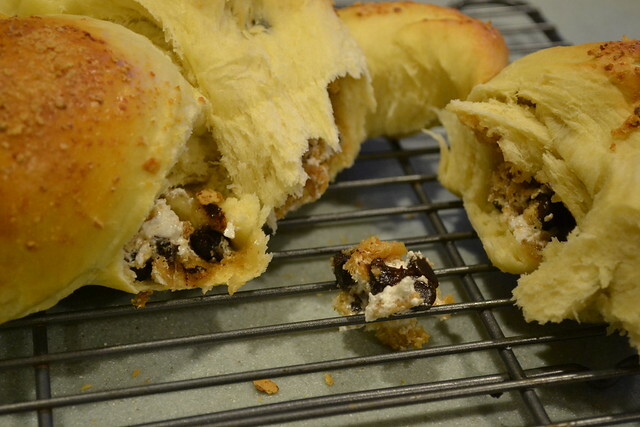 The Hazz even commented it smelled like s'mores while the challah was baking. It's a little bit silly. I mean, could we really serve this at a Shabbat dinner? Probably not. But, man oh man was it a great breakfast on Shabbat morning. What about you? 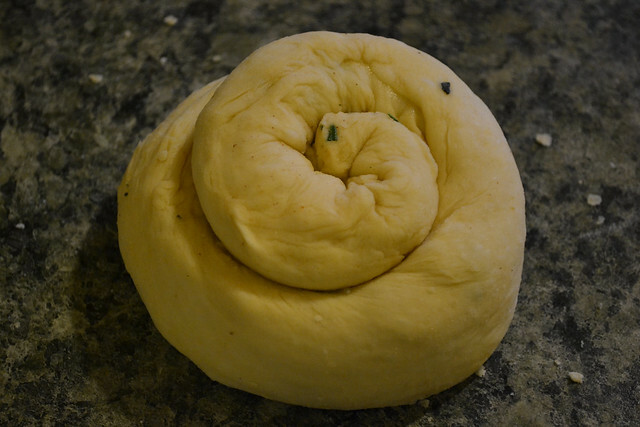 Have you made any ridiculous challot that turned about AMAZING? This one is definitely it. I just updated the Blogger Template to have a mobile view for iPhones, etc. It looks okay on my iPhone, but I'm curious if anyone else out there is a mobile reader. How does the template look? Is it clear? Would you rather the mobile site just be the regular site? Happy Tu Bishvat! Tu Bishvat is the Jewish arbor day, the new year of trees. There are special fruits to be eaten. 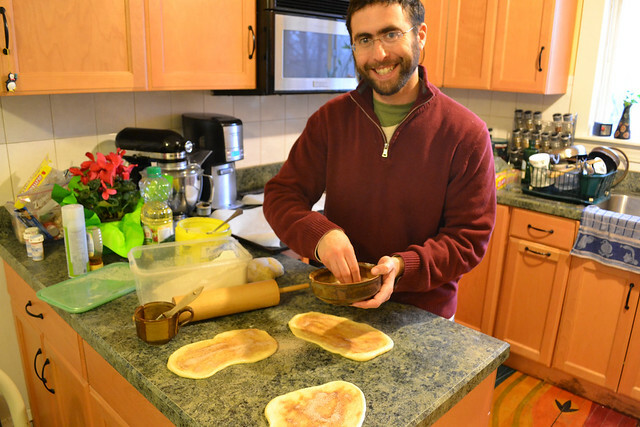 Last year, my friend Rabbi Phyllis over at Ima on (and off) the Bima created a special Tu Bishvat challah! I'm going to try something similar this Shabbat, but I wanted to share this with you today. Isn't it such a great idea? I'm really loving the shaped chalet lately. I wanted to get this up for you before this past Shabbat, but alas, I was only able to get you a preview! And Moses said unto the people: 'Fear ye not, stand still, and see the salvation of the LORD, which He will work for you to-day; for whereas ye have seen the Egyptians to-day, ye shall see them again no more for ever. The LORD will fight for you, and ye shall hold your peace... And Moses stretched out his hand over the sea; and the LORD caused the sea to go back by a strong east wind all the night, and made the sea dry land, and the waters were divided. Parshat B'Shalah is one of the Hazz's and my favorite Torah portions. For verse 14, he encouraged me to really give a loud chant in the Torah when Moses says "Have no fear!" B'Shalah also has the Song of the Sea, which has a distinction appearance in the Torah. Very cool, no? 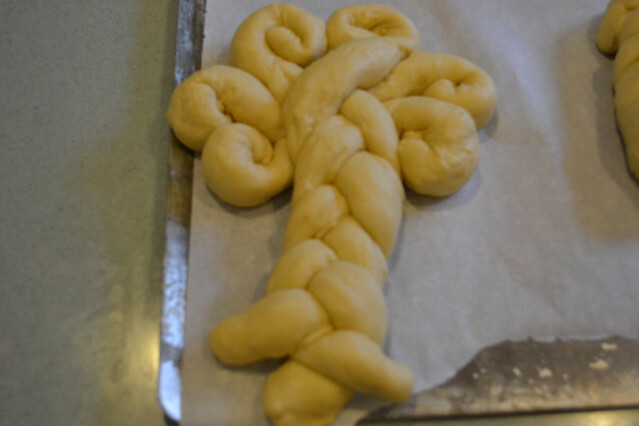 So, we thought we'd whip up a little Parting of the Sea Challah. 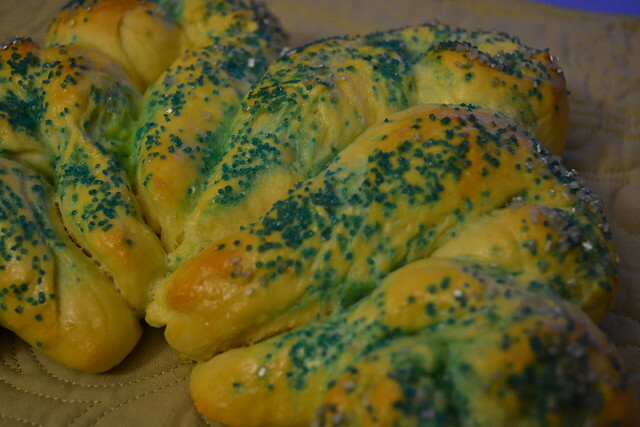 We used sprinkles to make it blue, so it basically tasted like a doughnut. It was great and really fun to make! 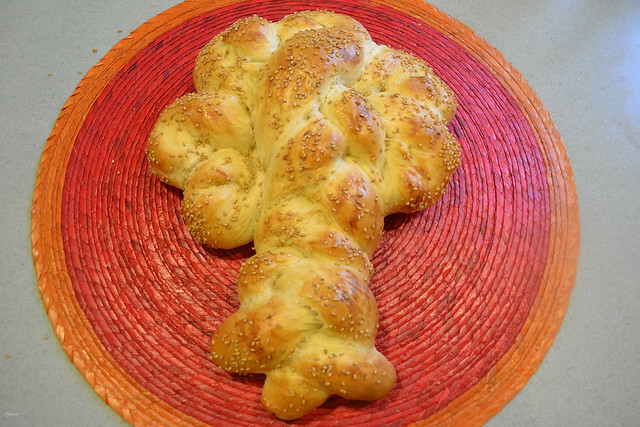 We decided to make a Parting-of-the-Sea challah in honor of our favorite parashah, B'Shalach. I'll update you later with the real pictures! Why have I been so busy lately? I miss you all!